We’ve had great fun imagining a family tea party set in the past. What a shame those six Karbatznick sisters and their two brothers aren’t around to attend. This is the story of the tea that never was. The venue for the afternoon was either Auntie Miriam’s flat in Melvin Hall, Golders Green, or Auntie Dora and Uncle Sam’s flat in Calthorpe Gardens, Edgware. Dora’s flat was the other popular suggestion, for reasons including this comment from Joyce Fish (Bessie’s daughter): “Auntie Dora was the best cook”. Feedback seemed to suggest that Dora was a real balabusta and her recipes certainly featured highly on the must-have list of food for the afternoon. Shelley Gilbert – Barney’s daughter – is lined up: “I will bring my silver teaset, a present from the aunts, as you cannot have tea made any other way.” Linda Levenson, Barney’s other daughter, suggested: “The teacups etc could be served from Auntie Miriam’s gold trolley. And, importantly, if you didn’t make tea in a silver teapot with fresh tea leaves, and use a strainer, it wasn’t a good cup of tea”. So teabags are strictly banned. There were other rules too: Dora’s granddaughter Helena recalls that, “The teapot must be warmed first. You must fill the silver teapot with boiling water, leave it for a minute or two, then throw that water away before making the tea. There simply is no other way”. Let’s deal with the sisters who won’t be spending the morning in the kitchen. Valerie Gellman says that her mum, Auntie Cissie, “would go to Grodzinski and buy either a chocolate schwartzvold cake or a Dutch pound cake (which my brother Jeff always called the cake with writing on it)”. Joyce Fish remembers with affection the cakes that Auntie Cissie bought, so we’re expecting several treats from her. Linda pointed out that Auntie Sylvia’s baking “did not exist”, but Uncle Barney’s contribution would be “a long block of plain vanilla ice cream which he would slice up and put between wafers.” Linda also suggested that “Dad might shoot up to Marble Arch to Lyons Corner House and buy one of their large creamy chocolate cakes or a box of chocolate éclairs, mille feulles and fruit tarts. (Yummy!)”. Another non-baker was Auntie Betty. Her daughter-in-law Gill Herman said that Betty would provide kichels from Parkway. There will be some home-made kichels from Auntie Dora too – and everyone would agree that Dora’s were better than Parkway’s. Joyce recalls Betty always being busy running her hat shop but finding time to make delicious bubalas at Pesach – this tea party isn’t at Pesach though, so we’re going without those. Before everyone sits down for tea, there will of course be plenty of nosh. Auntie Miriam featured highly here. Simon Walters (grandson of Dora) recalls her arriving at Carlton Close laden with Droste chocolates, his sister Helena insists that Auntie Miriam wouldn’t go anywhere without those boxes of Cadbury’s Dairy Milk miniatures, but Linda says, “What about giant bars of Cadbury’s Whole Nut? “And didn’t Auntie Miriam buy the largest nuts – peanuts, cashews and pistachios?” asked Linda. “Don’t rely on Grandma [Dora] for exotic nosh,” chipped in Helena – “bowls of hula-hoops were her must-have nosh”. Helena’s brother Leslie insists that Dora must provide small glass bowls filled with Cadbury’s Dairy Milk, lovingly broken into squares from a family-size bar. Helena wants to ensure that Auntie Miriam provides her trademark fruit for the kids. “She used to peel grapes for the kids,” recalls Helena. Tea versus dinner – the main question on our mind is, can we serve fish? No Jewish gathering is complete without gefilte fish, it’s as simple as that. Judging by the feedback from the family, we just have to allow Dora to provide some gefilte fish. We’re not relying on Auntie Bessie for baking. “My mother made pastry like cardboard”, says Joyce, but her fried fish was perfection”. Sorry, this is a tea party, so fried fish won’t be on the menu. Auntie Miriam would have had a busy morning in the kitchen. Alexander Gordon says, “Auntie Miriam’s smoked salmon pin-wheels were always my favourite.” Michael Warner concurs: “Those roly-poly things were absolutely delicious. Auntie Miriam’s were oval shaped as I remember them and my mum’s were round”. Judging by the requests, Dora would have needed several days in the kitchen: Alexander requested “Grandma Dora’s kichels and mandelbrot please.” For Simon, Grandma Dora’s jam biscuits were a must-have at any family tea. Beryl Walters says: “Mummy was a pastry cook first and foremost”. With demand for salmon rissoles from two sisters living in the same block of flats, let’s assume that Auntie Miriam and Auntie Bessie both made some. No Jewish family gathering is complete without a broigas, so we can assume that the two sisters would each get tetchy when someone selected a rissole made by the other sister. The shopkeepers of Golders Green would have done a roaring trade in the lead-up to our tea, with Auntie Miriam on the look-out for more food for one afternoon than her entire family could have imagined back in the Chicksand Street days in the East End. Miriam’s food was always the freshest, or so she said. The local shopkeepers would not dare to give her rotten fruit. Or fish for that matter; she studied the fish’s eyes to check they shone! Talking of fish, Auntie Miriam would inevitably have made more fishballs than anyone could eat. So the next day she would have jumped on the bus to the West End and made her way to her nephew John Lewis’s office in Fitzhardinge Street armed with food parcels. Woe betide the receptionist at the accountancy firm if she told Auntie Miriam that John was in a meeting. “But I’m his auntie, he’ll want to see me”, she’d mutter as she stormed off down the corridor to deliver a plate of gefilte fish balls to John. Michael Warner had a specific list: “I guess my favourites for a sumptuous tea were smoked salmon bridge rolls, egg mayonnaise bridge rolls, strudel biscuits, and marble cake. Ooohhh yyyeeeess. Michael is insisting on bridge rolls, but we’ll need sandwiches at our tea. A Karbatznick tea party wouldn’t be a tea party if it didn’t include sandwiches with the crusts cut off. Dora’s cooking has been in great demand so we’ve given Gill Herman the job of making the mandlebread. “Auntie Dora gave me lessons in how to bake mandlebread and I am told they are the best ever”. Auntie Dora prepared everything with meticulous accuracy – she took great pains to ensure that her biscuits were of equal size and proportion. 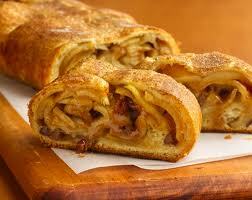 Strudel, mandelbrot, and kichels were baked as if meeting strict production line quotas. No visitor to her home ever left without a Tupperware box full of her home-made biscuits. Dora’s specialities were jam biscuits, strudel, matzo pudding, tzimmes, kreplach, kneidlach, french potatoes (croquettes). She pickled her own salt beef and also pickled her own cucumbers – the brine from which was wonderful to drink. Back to our tea. If we held the tea at Auntie Miriam’s, the kids wouldn’t want to go home – they’d be busy playing with the container full of ha’pennies that she kept for her kalooki games – but eventually they’d leave laden with more sweets and chocolates than they could possibly eat. There would be plenty of lively chatter around the table. Uncle Barney would fascinate the kids with the tale of John Lewis falling through the ice on Whitestone Pond in Hampstead. Auntie Miriam would be hauled off by the kids to join them in running races, following which she’d tell them how she had been a tomboy at school, beating all the other kids including the boys. Uncle Myer and Auntie Cissie would have the family agog with tales of their exotic travel to places which no-one else had imagined visiting, and there would be practical jokes too, as young Lilian Cramer and Maurice Colp ate their boiled eggs then turned them upside down in the eggcups and offer them to Bert, just as they did at the Colps’ home at 995 Finchley Road one famous day in post-war London. No doubt the family would laugh at the distant memory of an afternoon’s tea at Freda and Bert’s house in Golders Green on another day many years before. Niece Lilian spent a lot of time there, playing with Maurice who is a similar age. There were blackberries in the garden and Lilian ate as many as she could, then filled the two pockets on her dress with them. At tea soon after, a red patch spread out on Auntie Freda’s beautiful tablecloth from the contents of Lilian’s pockets. Lilian was mortified. Presumably Freda wasn’t overjoyed either. Uncle Leon would probably play a practical joke at our tea. He used to phone regularly from Dublin, where he lived, and often when he phoned, was just around the corner, ringing from a phone box, so would give everyone a surprise when he turned up minutes later. He loved pranks. Leon would joke about the food. He had dinner at Dora’s one time, and when she served dessert he said, “I only like it with custard”. 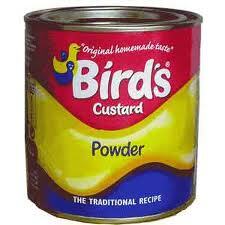 After he left, Dora found a sachet of custard posted through the letterbox and thought it was a free sample. Dora, amazed at this coincidence, said, “See, a good heart never wants,” not knowing that Leon had gone to a shop, bought the packet and delivered it! Needless to say, a Jewish tea won’t feature much alcohol. Auntie Freda will of course have had her daily lunchtime Guinness, prescribed by her doctor to help her iron levels; Auntie Miriam might have a secret tipple of brandy later in the evening; and Auntie Dora and Uncle Sam would only have a glass of brandy on New Year’s Eve. Drinking isn’t this family’s strong point, though there’s a story from the archive which may explain why. In the East End of the early 20th century, Leah Karbatznick brewed a wine called med/mead, which was fermented at home for consumption in the house. One particular day, she asked her daughter Bessie to put the dregs in the dustbin, but the child lazily threw them into the yard instead. Next morning all the chickens were laying flat out in the yard, blind drunk. Of course our what-if tea party would not be complete without the brothers and sisters recounting the story of the family’s chickens – and duck. The family kept chickens in their back yard; they had fresh eggs and it was understood by the children that eventually the chickens would all be sold to a shochet for slaughtering. The family also kept a duck in the back yard – but the duck was strictly a pet. So when Leah told the children at dinner one night that the roast in the oven was their beloved duck, none of them could face eating it. They all went hungry that evening. Even she couldn’t face eating it. Surrounded by so many types of cake and biscuit and savoury and bridge roll and goodness knows what else, conversation would inevitably come round to the family gatherings when the Karbatznick children were young. One of them would re-tell how their mother was a wonderful ‘provider’, able to provide a meal for ten people every night with whatever ingredients she could muster. Dora would remember the meals eaten without their father, as he often worked late to pay the bills, and there would be a tear in her eye as she told the story of her mother discovering her, aged maybe 5 or 6, at the bottom of the stairs well after bedtime one evening. Leah told Dora to go back to bed, and Dora explained that she simply wanted to catch a glimpse of her father, as he worked such long hours that she hadn’t seen him for a while. On the day of our tea, no-one’s staying for dinner, as Auntie Miriam and Auntie Bessie will be heading off to play cards and Auntie Freda will be rushing home for her nightly gin and tonic. Uncle Barney will be heading back to Bournemouth and Auntie Dora and Uncle Sam will want to get home for a quiet evening in their matching armchairs in front of the Nine O’Clock News on BBC1.